From the Baldwin County Courthouse, go east on Hancock St. one block. Turn right (south) on Wayne St., which becomes Business 441 South. Follow Business 441S for 1.8 miles. Turn right on Allen Memorial Drive. Drive 1.3 miles to 266 Allen Memorial Dr. on right. 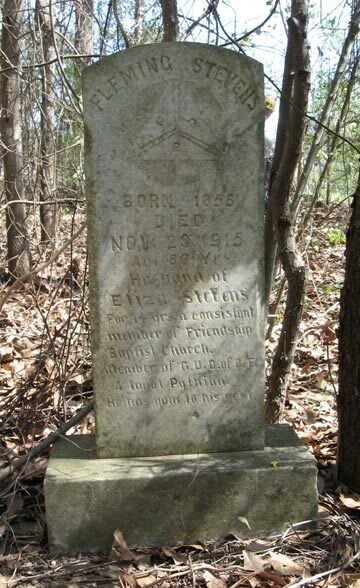 The cemetery is behind the house in the woods and is about 120 yards from Allen Memorial Dr.
*On Fleming Stevens' grave is reference to G. U. O. of O. F. The Grand United Order of Odd Fellows is a fraternal organization founded in 1843 for black people. Created at a time when the International Order of Odd Fellows was primarily a white-only organization, the G.U.O. of O.F. obtained its charter directly from the Manchester Unity in Great Britain so the American IOOF organization had no control over it. Age 60 yrs. Husband of Eliza Stevens. For 14 years a consistant member of Friendship Baptist Church. Member of G.U.O. of O.F. A loyal Pythian. He has gone to his rest. At least 2 additional graves, evident by depressions and broken bricks.